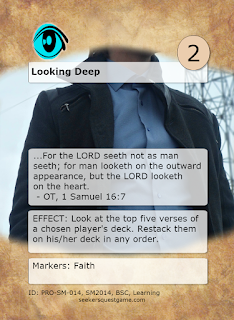 Verse Rule: EFFECT: Look at the top five verses of a chosen player's deck. Restack them on his/her deck in any order. It was kind of tricky finding an image for this one, but I’m really pleased with the one I found. It’s a pic of a person’s chest, or heart, but it’s not a drawing or an abstraction, but includes the dress and style of the person as well. We look at the face, the shirt, the suit, but God looks past that. Combos, tips: It’s actually a pretty powerful effect. You get to “look deeper”. In play, that means that you can know what’s coming, or you can bury an opponent’s good verse, or bring less valuable ones to the front.